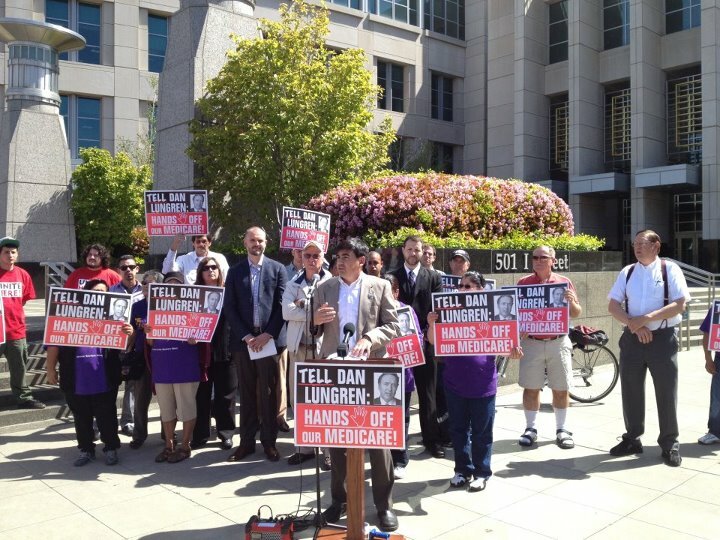 Today, we joined other Sacramento leaders in front of the Federal building, to protest a decidedly uncivilized proposal–to give significant tax breaks to the richest among us, to cut and undermine core health programs like Medicare, Medicaid, and the Affordable Care Act. Of course, we are referring to the “Ryan budget,” the measure passed by the U.S. House of Representatives last week, with the support of several California Republican Congressmen, including Representative Dan Lungren. David Watson, music entrepreneur and member of Patriotic Millionaires for Fiscal Strength, talked about the benefits he got from taxes growing up–helping with his college education, or having his parents on Medicare and Social Security. He doesn’t believe that these programs should have to be cut in order to provide a tax cut to himself and others who have been fortunate and got the most benefit from those societal investments. Rep. Lungren has repeatedly voted in favor of proposals like the Ryan budget that offer huge tax breaks to millionaires at the expense of seniors, low-income Americans and others. On health issues, the Ryan budget does a lot of damage, beginning with the repeal of the Affordable Care Act, which would deny coverage to hundreds of thousands of Californians already getting coverage now, and millions more in 2014 and beyond. The Ryan budget would cut and cap funding for Medicaid into a “block grant,” placing California in an untenable position of exploding our state budget even more and/or making massive cuts to a core program that covers over 7.5 million Californians, including many seniors and people with disabilities–something than any family could find themselves needing at some point in their lives. It’s hard to imagine how a California Representative from either party could vote for the Ryan budget. California already has one of the lowest per-patient Medicaid spending ratios in the nation, and so the over 22% reduction can’t be achieved by anything but direct reductions in care. As speakers pointed out, these House GOP cuts are not to primarily reduce the deficit, but to pay for massive tax cuts to the wealthiest–not just to extend the Bush tax cuts, but to make additional tax breaks, averaging hundreds of thousands of dollars for millionaires. It’s outrageous. On tax day, it’s good to push for tax fairness, and to remember what we can do together, to achieve common goals, whether it be local schools, national defense, or a health system that we all rely on.